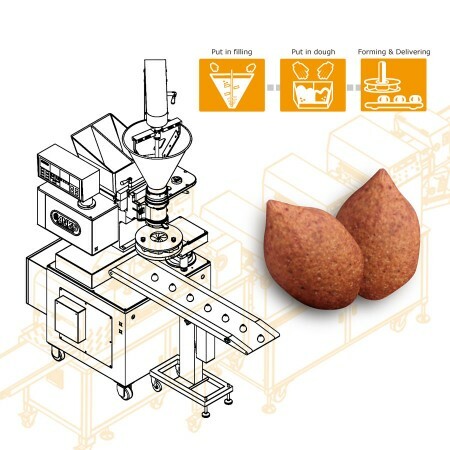 Kibbe Machine and Equipment - ANKO High Efficiency Kibbe Production Equipment Design | ANKO FOOD MACHINE CO., LTD.
ANKO's SD-97W Automatic Encrusting and Forming Machine, has the capacity to work with bulgur and meat as the encrusting skin to make various kibbe. 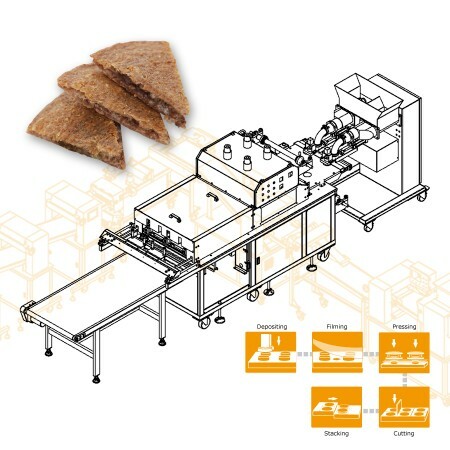 The machine has high capacity and simple to operate, just load the tanks with premade bulgur mix and desired fillings, and it can produce up to 4,200 pieces of kibbe per hour. The same machine model can also work with more viscous dough to produce different types of dumplings, cookies or stuffed buns. Kibbe, Kubba, kibbeh or kebbah is a Levantine dish made of bulgur (cracked wheat), with minced onions, ground lean meats, Middle Eastern spices. The name derives from the Arabic word for “ball”, hence implies the shape of Kibbe, which normally is made into a torpedo or American football-like shape, stuffed and fried croquettes. However, there are also varieties of Kibbe that are round or flat patties that can be baked or cooked in broth. In many Middle Eastern countries, kibbe, kubba or kibbeh are considered the national dish, and it's becoming more and more popular parts of North African and Latin American countries. The machines listed below are designed for making Kibbe. Please feel free to contact us via the form below. We will happy to answer any questions you may have regarding our products, services, and turnkey projects. Table Type Automatic Encrusting and Forming Machine is a small size machine, stainless steel, for limited space. The shutter unit designed by ANKO not only enhances the stability of production process, but also varies products through the ease of changing shutter unit. Products with patterned or non-patterned; with bean paste, meat, sesame paste or no stuffing are producible. Dozens of ethnic foods such as meat bun, steamed bun, mammoul, meat pie, pan fried stuffed bun, mochi, crystal dumpling made by SD-97SS can compare with handmade ones.